Expanding Opportunities selects children from the millions of orphaned, rejected and destitute children in Kenya. The selection process is a painful privilege. This is a story of one child who was NOT selected. 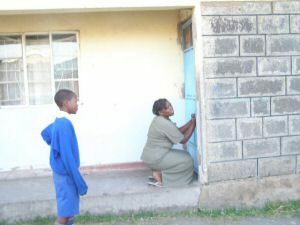 Many ask how the decision of which children to accept into the Joseph Waweru Home School is made. The short answer is that it is not easy. The long answer involves each individual story, lots of prayer and a vote. Personal referrals, churches, Children’s Bureau, missionaries, serendipitous meetings on the street, all are sources from which of the thousands, no millions, of children orphaned or rejected will be interviewed. The work of interviewing is a painful privilege. Here is one short story. We had many children to interview. This child was already in school. Neatly dressed, culturally submissive, he sat shyly with a well-dressed woman and our referent. “Hmm, he really doesn’t need us. Is this his mother? Why does she want to get rid of this child?” The thoughts come, then the handshakes and greetings. The boy is hiding his face, wiping away tears. “Let’s go to your home where we can sit without drawing attention and talk, then we can see how the boy really lives.” I thought. As it takes a bit of time for the car to come, we begin the preliminary questions. Name, parents, school, grade….. “Oh, this is the sister, both parents are dead.” The boy does well in school. He is 4th in his class of 68! 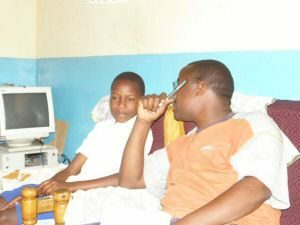 At 12 years old, he is in the proper class for his age so his education has not been interrupted. Finally we reach the house to find a very nice, typical cement duplex apartment building. Inside it is clean, neat and well furnished. We wonder why this sister wants her younger brother in a Home. What is wrong? Again tears flow down the boy’s face as our gentle interpreter, Mwangi, asks questions. My thoughts wander from one extreme to another, from one hypothesis to another, from one assumption to another. The boy is happy with his sister; there is no abuse, there is food, school uniforms, bed, cousins. What is wrong? We remain as the story unfolds. There were 9 children. The parents were HIV+ and died of HIV related diseases leaving the older children to care for the younger. Our interviewee was the second to the last child. Only 7 years old when he lost his parents, he remembers and misses them deeply. He was separated from his younger sibling as he went to live with another sister. He has not seen this sibling for three years! He learned that this youngest child was given to a children’s home. He longs to see his brother. Will he suffer the same fate? The sister begins to unfold her story. She too is HIV+. She proclaims her status as she discusses her volunteer activism in a Hospice type visitation, assistance and advocacy program. She is taking ARV treatment and appears strong and healthy. Yet she is facing surgery in the next week. She has three of her own children and two of her siblings. She has been unable to work at her small business selling used clothing as her health can bring her down for long periods of time unexpectedly. Her husband is employed in a position that rarely pays enough for them. The rent has not been paid for one year, there are times with no food on the table. As she factually lays out her current situation, she is not begging, nor expecting anything extraordinary. She is not overcome but is an over comer. She is planning for the future of the children. Living with strength and hope, she faces inevitable death in a different way than most. She is acutely aware that it may come early for her. Mwangi interviews gently. We left overwhelmed. This child remains with the sister who loves him enough to plan for his future. His tears turned to smiles. Our door is open when this one closes. We trust the financial support will be there also.